Arsenal emerged 3-1 winners against Leicester City at home on Monday night after going down 1-0 in the first half. At one point, it looked like the visitors wouldn't leave the Emirates empty-handed. However, the overall brilliance in response to going behind was quite impressive. The Foxes had a very valid shout for a penalty when Rob Holding handled the ball in the Gunners' box, but the referee, who did have a good view, ignored the claims. The visitors got their goal in the 31st minute of the match through Ben Chilwell, whose burst of pace saw him beat Hector Bellerin and force the Spaniard to deflect into his own net. 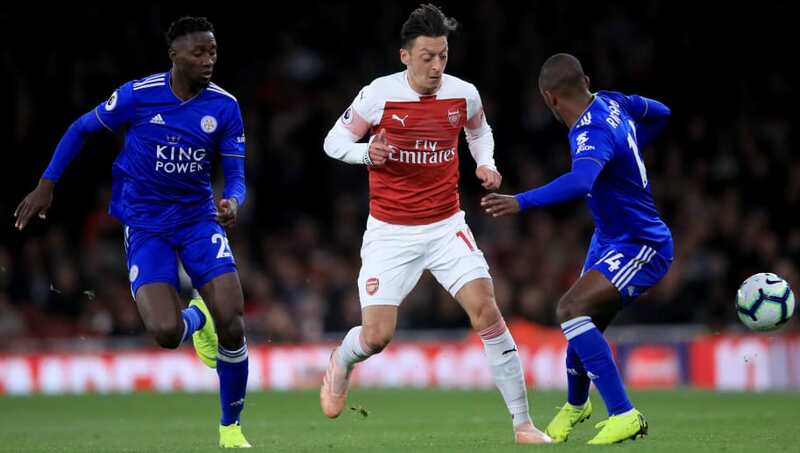 Arsenal hit back just before halftime as ​Mesut Ozil expertly guided Bellerin's low cross past Kasper Schmeichel to level the score at 1-1. Anybody watched Arsenal-Leicester? It's almost as if having quality strikers wins you games. The second half was all ​Arsenal, though, with Pierre-Emerick Aubameyang coming off the bench to score a brace in just five minutes. Here's the breakdown of the match below. The Gunners were kept on the back foot for most of the first half as ​Leicester played quite high up their pitch. The pressure paid off with the own-goal, but the Londoners would mount up a challenge of their own as soon as they went behind and would get themselves back level before the halftime whistle. They ramped things up in the second period and it must be said that the pace and aggressiveness of their attack did the job in the end. The passing was also fantastic and that last goal had Arsene Wenger written all over it. The Frenchman must have smiled at that one, providing he was watching. No question about it, the German was magnificent as he led his side to a remarkable comeback win, starting it off with an equalising goal before pulling the strings in midfield to set up two more. ​Aubameyang does deserve a shout for getting that brace but they were rather simple for him and there wasn't much else to do besides tap in after all the brilliance was built up ahead of the goals themselves. Mesut Ozil playing like a man who’s absolutely f*cking desperate to be named in Garth Crooks’ team of the week. Admittedly, Arsenal fans don't get to see this Ozil as often as they would like to. And it's certainly looking like his decision to retire from international football has paid off on club level. If he can regain some consistency and keep being as creative, he will surely be worthy of that mega-deal he signed earlier this year. Holding could have easily been sent off in the first half. The young defender got an early yellow card for grabbing a Leicester player and his hands should have gotten him in trouble again minutes later. Rob Holding is a very lucky boy there, penalty all day that! Had the referee given the penalty, he would have likely brandished a second yellow too. Holding was very, very lucky. Despite their early-season wobbles, Arsenal have made strides under Unai Emery and look a much better side than the one that lost to Manchester City and Chelsea early in the campaign. They will be looking to improve their position in the Europa League as well, with a match against Portuguese side Sporting CP coming up on Thursday, and their next Premier League stop will be Selhurst Park, where they will hope to best Roy Hodgson's ​Crystal Palace. In stark contrast to the aforementioned summary, the Foxes started the match very well and put Arsenal under loads of pressure early on. They were forced to take their feet off of the gas after getting that own-goal and were completely dominated from there on out. They will be very disappointed not to be given that penalty after Holding handled in the box and will have every right to feel hard done by. I love how everyone’s saying Ozil only played well cause it was Leicester. Sometimes just appreciate greatness, to play the way he done tonight vs any Premier League team deserves praise of the highest level. But it does feel like they would have struggled to cope with the Gunners in the second half regardless. Unfortunately, James Maddison wasn't able to impact the game as he would have liked, but he did show loads of quality in midfield, especially when they controlled the game during the first half. Maddison has been one of Leicester's best players since joining the club over the summer and will certainly have much better games. On Monday night, though, he was their best player and could have probably done even better. Forced a good save from Bernd Leno in the first half off with a free header, but the England international can't claim to have played a great defensive game. ​Maguire was quite slow at the back and didn't track runs well enough and should be disappointed with his performance. Generally, though, he is a quality centre-back and should show improvement in future. The Foxes will be very disappointed with the result especially after that great start but will also rue that handball which went unpunished. It's looking like this campaign could be a very challenging one for Puel and his men. But they have enough quality within the side to make up some ground.